This epic photo shoot was organised by Canadian photographer Benjamin Von Wong. In order to pull it of he involved 2 models, 7 safety divers and one 50-year-old sunken shipwreck in the waters of Bali. No photoshopping was involved - other than post production, allegedly. 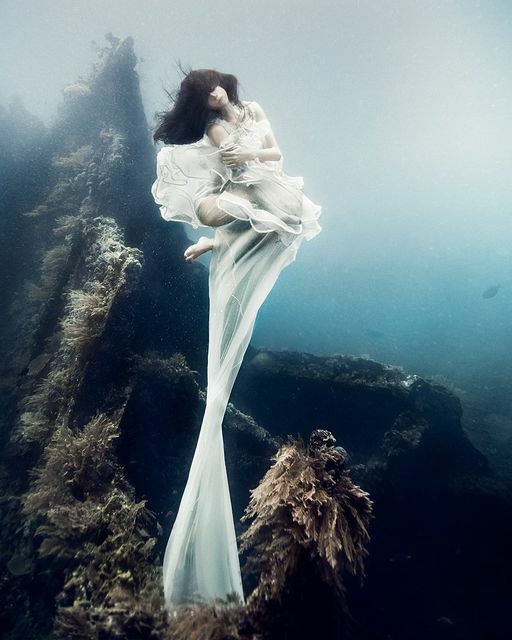 “Teamwork – A word that truly begins to mean something when you’re shooting 25 meters underwater and your model tied to a 50 year old shipwreck in the middle of Bali where the slightest miscalculation could spell disaster,” writes Von Wong, perfectly illustrating the scale and the dangers of this underwater project.